“A town (Gk, polis) on a hill cannot be hidden” (Matt 5:14). I wonder if Jesus had a particular place in mind? View to 19th c Suffuriyyah, a town on a hill. Drawing from W. M. Thompson (1859:133). Source. Today, Bird-town is a National Park administered by Israel’s Nature and Parks Authority. It is inhabited by protective fences, a visitors’ center, tourists, and archaeologists. I stand near a small kiosk at the entrance, catching my breath along the Jesus Trail. The road before me follows a ridge to the site. Ancient aqueducts flank the road on either shoulder. These channels carried water to a city remembered in the New Testament period as “The ornament of Galilee” (Josephus, Ant. 18.27). There are good reasons for the label. Sepphoris was part of a profound renewal of the region that took place in the early decades of the first century AD. Herod Antipas (the son of Herod “the baby-killer” known from the Christmas narrative) transformed Galilee in the space of a single generation. Within Jesus’s own lifetime, the twin centers of Sepphoris and Tiberias were constructed anew. The rural countryside was aligned to “feed” these cities with population, labor, crops, and taxes. View to the lower city of Sepphoris. The stone paved road through the center of the city is the decumanus, the major east-west corridor. It yields to modern asphalt on the near horizon where the cars are parked outside of the visitor’s center. The outskirts of modern Nazareth are visible on the distant horizon (right). In the case of Sepphoris, Reed suggests a working population of 8,000 to 12,000 inhabitants (2002: 82). It must have been an amazing place, constructed on an orthogonal plan (built on a rectangular grid) with paved streets, markets, a theater, bathhouses, and many private homes and public structures. Some of these are decorated with painted plaster and exquisite mosaics. Archaeologists continue to recover and study the remains. What was lost is found. I try to imagine how Sepphoris would have appeared to a traveler camping along the road between Ptolemais and Tiberias. From the valley, s/he could look up and see the twinkling of thousands of oil lamps. These were flung against a midnight tapestry stretched from the oak forest below to a million more stars overhead. If this was the place Jesus had in mind, he was spot-on: there is no hiding this display. Over the course of time, the jewel that was Sepphoris lost its luster. Its ruins did not disappear, however, but were incorporated into the living landscape of generation after generation of residents. The heir of Jewish Sepphoris was Arabic Suffuriyyah. 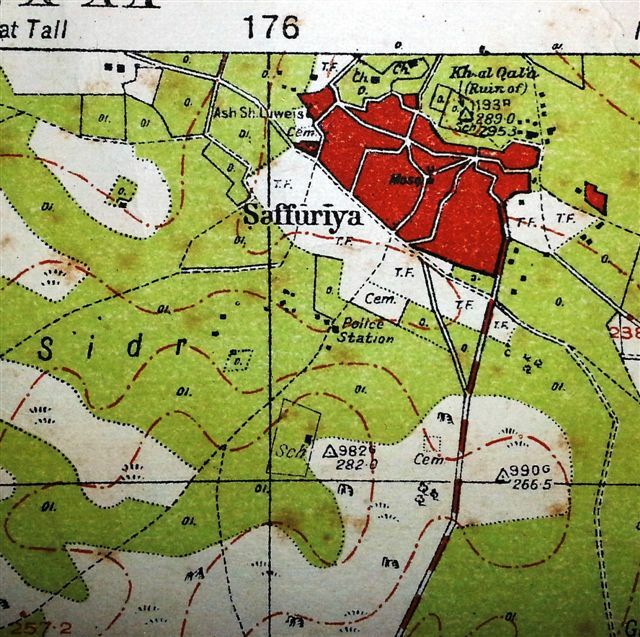 In 1944, Suffuriyyah was still a significant place of more than 4,000 people. Maps and photographs show the vibrancy of this 20th century village. View to Suffuriyyah from the south. The large structure on the top of the hill is a Crusader-era fortress. It was used as a school by the local inhabitants. Source. However, on July 15, 1948 the village was bombed. The newly-formed Israel Defense Force entered the town as a part of a calculated sweep of Lower Galilee. Residents were killed, forced to flee, or deported. Suffuriyyah was declared a closed military zone and ceased to exist. Wardozers leveled the structures that remained and a needle forest was planted over the village by the Jewish National Fund. The forest was dedicated to the Independence of Guatemala (I am not kidding.). Today, tree roots are dismembering the ruins and graves of Arabic Suffuriyyah. It is a parade example of cultural erasure. What was found is lost. Detail from a British map of 1942. The village of Suffuriyyah in red.Source. Google map of Sepphoris/Suffuriyyah. Excavations (light beige) are revealing the Greco-Roman period capital. Needle forest hides the “erased” history of the site. British map and Google map pressed together. Note how the outline of the forest matches the outline of the village. This is hardly coincidental. One aspect of this city on a hill has been found. Archaeologists sift its remains. At the same time, another aspect of the city has been lost. Or hidden. The erasure of Suffuriyyah is not complete yet. It continues to exist in the memory of some. A suburb of modern Nazareth is called Safafraby locals. Its inhabitants (that number some 10,000 persons) are now the second generation of those who originally fled old Suffuriyyah. Ironically, one can peer out the window from Safafra and see the wooded hill and fields of what was once Suffuriyyah. The farmland that surrounds the wood has been confiscated and is incorporated into the holdings of two Jewish settlements, Zippori and HaSolelim. This odd state of affairs only confirms the claim of Jesus. Our deeds are not done in secret. Salt and light are sorely needed in the matter of Bird-town.